Articulate Online offers a Guestbook feature, which allows you to collect whatever data you want about the users who view your content. Once you set up a Guestbook for a particular content item, users who access that content will see a Guestbook page in which they will enter the informations you requested before they view your course. 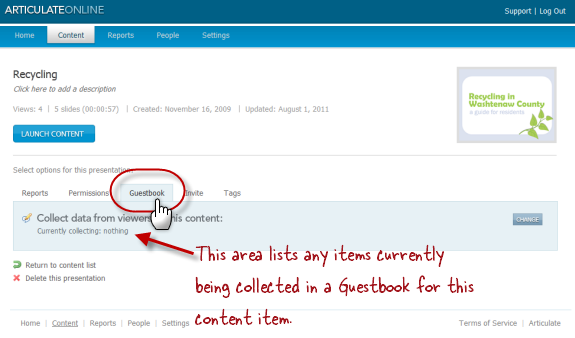 In Articulate Online, select the content item for which you want to create a Guestbook. Click the Change button on right right-hand side of the screen. 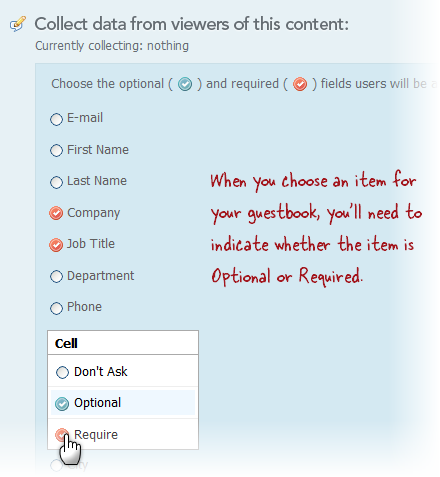 Select the items you want to include as Guestbook fields, and for each one, indicate whether it's Optional or Required. 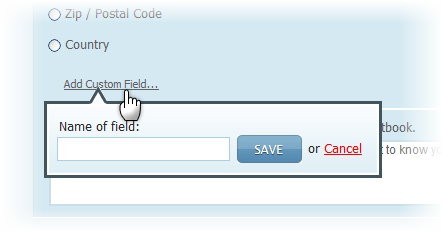 If you change your mind about any of the fields you’ve selected, just select the field again and choose Don’t Ask. Keep in mind that if you do create a custom field that you plan to use for other content items as well, be sure to type it the same way for each content item's Guestbook. Otherwise, when you report on the data, it will look confusing because it will be treated as two separate fields. In the text area below the list of fields, you can customize the instructions your users see on the guestbook, if you like. When you’re finished, click Save at the bottom of the page. Where Is Guestbook Data Used? You can report on the Guestbook data you collect by going to the Reports tab and choosing the Guestbook Responses report. When you do that, you’ll see data for the five most common fields that administrators typically like to include (email, first name, last name, job title, and company). If you didn’t include these items in your Guestbook, or if you made any of them optional, some cells might be blank. 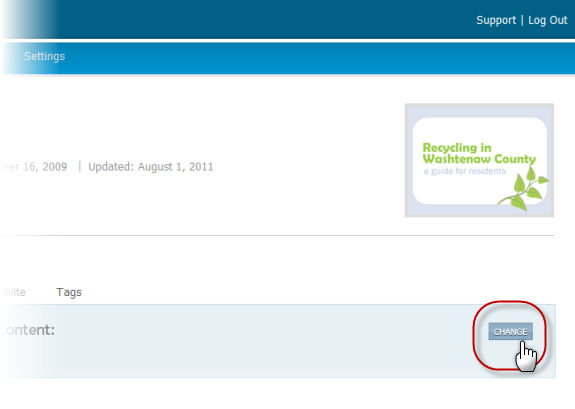 You can also include Guestbook data in any custom reports you create. 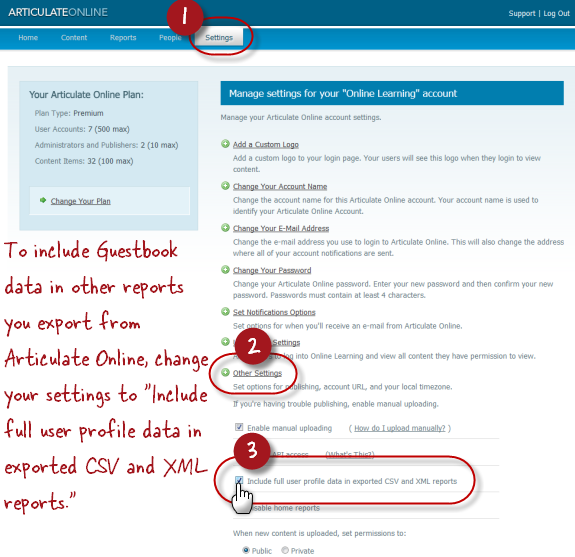 And, if you’ve specified in your Articulate Online settings that you want to Include full user profile data in exported CSV and XML reports (as shown in the screen below), then any reports you export will include data from the standard Guestbook fields. Custom fields, however, are not included in the export.